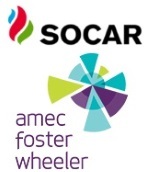 édité le 14/03/2016 - Plus de news de "Socar" - Voir la fiche entreprise de "Socar"
On March 11, the Heydar Aliyev Oil Refinery and Amec Foster Wheeler/SOCAR Foster Wheeler alliance signed Front-End Engineering Design (FEED) contract within the framework of the project of the oil refinery reconstruction and modernization. Rovnag Abdullayev, SOCAR President, Marco Moresco, Amec FW President Southern Europe and other representatives of the companies’ managements attended the signing ceremony. Welcoming the guests, SOCAR President Rovnag Abdullayev pointed out the importance of the oil refinery reconstruction and said design and construction would be carried out step-by-step in 2019-2020. He said the refinery have already signed contracts with licensers and completed elaboration of the process planning packages. Marco Moresco, Amec FW President Southern Europe, expressed satisfaction with the alliance’s involvement in the project as a FEED contractor. The contract was signed by Elman Ismayilov, Director of the Heydar Aliyev Oil Refinery, Enzo Gioviale, Director of Commercial Operations, Amec FW and Elmaddin Dadashov, General Manager of SOCAR FW. With pro-forma 2014 annualised scope revenues of £5.5 billion and over 40,000 people in more than 55 countries, the company operates across the whole of the oil and gas industry – from production through to refining, processing and distribution of derivative products – and in the mining, clean energy, power generation, pharma, environment and infrastructure markets.